The Mothership: Zingerman’s! | Delicious! Delicious! Caryn makes a valiant attempt to drown out the radio with her stellar, off-key singing. She proudly wears a faded, dark blue t-shirt with MICHIGAN printed in maize-colored letters. Caryn enters the traditional, Mid-Western house that has been transformed into a haven for any discerning cook. It is a small space, but the shelves are lined to the ceiling with delectable goodies. Caryn picks up a basket as she is greeted from behind the bread counter by a COLLEGE WOMAN with pigtails and a wealth of earrings. She scans the rows and rows of hearty, golden breads stuffed with everything from olives to chocolate and cherries. Have you been to Zingerman’s before? Caryn looks up and smiles. And indeed she has. Caryn fills her basket with unusual expertise, knowing exactly what she wants from the enormous selection of fine cheeses, imported dried pastas and rare teas. She doesn’t miss the meat counter or the array of chocolate. When one basket is filled, she grabs another. The coffee house is filled with dining tables where the delicatessen patrons enjoy their prized sandwiches. Caryn sits at a table, patiently reading a catalogue. Several large bags brimming with her loot fill the other chairs at the table. A WAITER sets a basket in front of her. Tangy sauerkraut topples out of the side of the reuben sandwich and into the basket. Caryn picks the kraut up with her fingers and tastes it. It is good, but it is not why she is here. She gently scoops the sandwich into her hands and sinks her teeth through the crispy rye bread and into the tenderest corned beef known to man. She has travelled across the country for this moment and it is worth every mile. Caryn lugs her bags through the store on her way to the car when she is stopped by the pigtailed woman from before, now behind the deli counter. Oh, it was perfect, thank you. Caryn turns toward the door, but hesitates a moment before turning back. Actually, I’ll take another one of those reuben sandwiches to go. 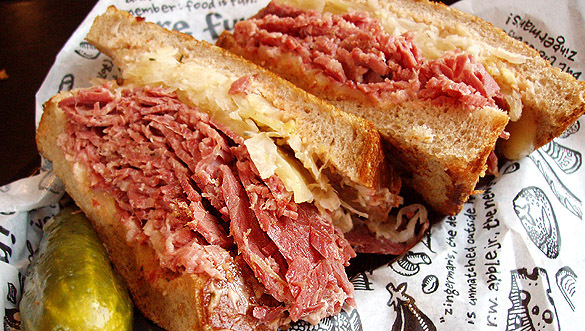 Zingerman’s Reuben Sandwich is not only an example of the best of its kind, but for this University of Michigan alumna, it is a true taste of home. When you can’t make it to Ann Arbor, Zingerman’s has a wonderful online catalogue that will keep you satisfied until your next trip. It includes a reuben kit. I know your writing is wonderful but your photography simply blows me away! Your images are crystal clear, incredibly vivid & tantalizing and impeccably lighted. Any hints for the rest of us? I love Zingermans too, though I have only ordered through the mail. I must make a trip there someday! I shouldn’t be hungry this early in the morning, but dang that sandwich looks good. Gonna have to look into that “kit”. I’m in the mood for a great Reuben. I’ve never been to the store, but the Zingerman’s book, Guide to Good Eating is terrific. I highly recommend it. Kind of like a culinary buyers guide with some recipes and tips thrown in for good measure. Rainey, I must say that I have learned a lot about photography since I started this blog. Each entry means a little more practice under the belt. I’m glad you enjoy it! As far as hints go, the only hard and fast rule by which I abide is never use a flash! I can’t stand the washed out look of the flash. Only one picture on the whole blog used a flash (and I had no control over that decision). Beyond that, it gets more complicated…exposures, lenses, etc. If you want to know more, I’m happy to send an email your way, but I think I shall bore everyone here if I go into much more detail. Zingerman’s Reuben Sandwich. It’s very important to steam the corned beef or it will dry out. Amy, I have the Guide to Good Eating too! I love to see the research that goes into all the products that they sell. Amazing read! They ship internationally – yay! Admittedly, I’m just over the border in Canada, but I’m still wondering if the quality would be compromised. Has anyone ordered from them before? Tara, I have ordered from them many times and the fresh kits are usually pretty good. Do follow the directions to which I provided a link above if you order the reuben kit. I have had someone prepare the ingredients for the sandwich ALL WRONG and the corned beef was dry and not good. But when done right, mmmmmmm! Zingerman’s is also great about customer service. I once received a gift that I wasn’t expecting and UPS didn’t follow the directions on the box to leave it without signature. When I finally received the package a few days later, the ingredients were spoiled. Zingerman’s sent me a new one immediately at no charge. THEN I sent them a thank-you email, which they responded to with the nicest emails. They are just the friendliest people who have built their company on kind customer service. So all that is to say, that if you are unhappy with their products, they work to rectify the situation as best as they can. Whew! Is that enough of a review? i went to grad school in ann arbor and lived just down the street from zingerman’s. loved their baked goods, their sandwiches. i thought everything was a little overpriced (the farmers market across the way was a bit less pricey and just as good), but since i wasn’t from the midwest, i chalked it up to being in ann arbor. a month ago, on the way back to chicago from canada, we stopped in ann arbor for lunch at zingerman’s. still great sandwiches and chocolate in ann arbor. Not only did they build their compoany on Customer Service they now teach it to others. They offer extensive seminars and classes on Customer Service that are highly regarded. I visited a friend in Detroit last summer and one thing I insisted on doing was making a trek to Zingerman’s for a Reuben. Man, we were reading and re-reading that menu the whole way there, trying to decide what to get. Pastrami? Corned Beef? Brisket? It was the best sandwich ever. Caryn- I would VERY much like those photo tips. I sent an e-mail saying so but my e-mail ID is the unfortunate “Daffy Duck” so you may have deleted it without a second thought. Zingermans has great sandwiches. Whenever Im in AA Im sure to stop by for lunch. Whoa, momma. I’ve been making iced tea from the Zingerman’s Universe o’ Tea that our resident personal chef gave me as a gift a while back. It’s delicious and packs quite a caffeinated punch!